It’s been a guiding passion for Powers, and one she’s passed on to both her daughter and granddaughter. Becky Paulson, her daughter, was a mere six weeks old her first time on a horse, and she began riding independently at age two. Savannah, her granddaughter, has proven similarly precocious. Powers and Paulson both consider themselves blessed to work out of the Evergreen Valley Riding Center. Powers is the barn manager; Paulson is a private trainer. “I teach the basics on up,” Paulson explains. Her clients compete at both the 4-H and breed level, and Paulson’s students have performed admirably multiple times at the Pinto World Show in Tulsa, Oklahoma. Now age six, Savannah–or Vannah, as she’s usually called–is no stranger to the barn. 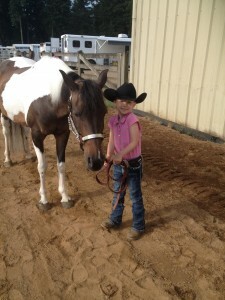 She can already clean a stall, and she’s been riding competitively for four years. Currently, Vannah rides Taffy, the large pony Paulson herself used when she was eleven. Savannah Paulson did her first solo ride at age two. Now, six, Savannah rides Taffy. Certainly, Powers and Paulson have reason to be proud of Vannah’s empathy. When Vannah first saw Sarah McLachlan’s commercial for the American Society For The Prevention Of Cruelty To Animals, she was moved to tears. Vannah asked her mother how they could help. “I honestly thought she’d just forget about it,” Paulson confesses. But Vannah mentioned it again near her birthday, and decided to ask for Thurston County Animal Shelter donations instead of presents. It’s become her tradition, and to date she’s donated over $1,500 of money and supplies. Giving back to the community runs in the family. Powers is the Superintendent of the Horse Department for 4-H at the Thurston County Fair. What does this elected position entail? Organizing tons of volunteers, finding judges, getting sponsors, ordering ribbons and trophies, plus arranging for equine vet checks. It’s a year-long responsibility that culminates with fair events–and not just the ones attended by the general public. 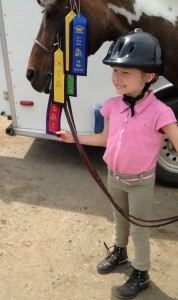 4-H riders complete pre-fair qualifications. There’s also a 15-mile competitive trail ride on Fort Lewis. Since age four, Savannah has celebrated her birthday by collecting donations for the Thurston County Animal Shelter. “And to give back to the community,” Paulson adds. 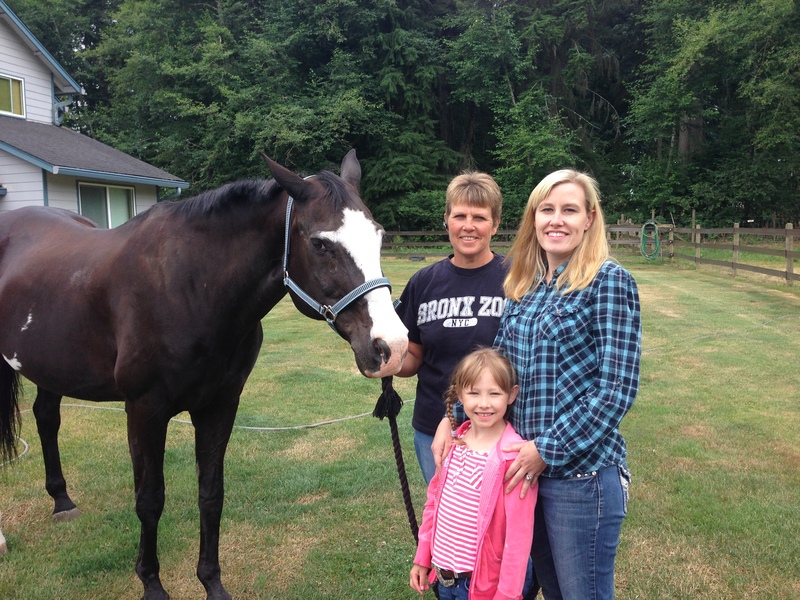 All three generations of these remarkable horse women will be at the 2014 Thurston County Fair. Come say hello, or take the opportunity to cheer on Reflection’s Pride. This year the fair runs from Wednesday, July 30 to Sunday, August 3. Check the calendar of events for more detail.